This was a huge success at our house! I personally did not think I would like it, but after trying it, I see why it is so good. 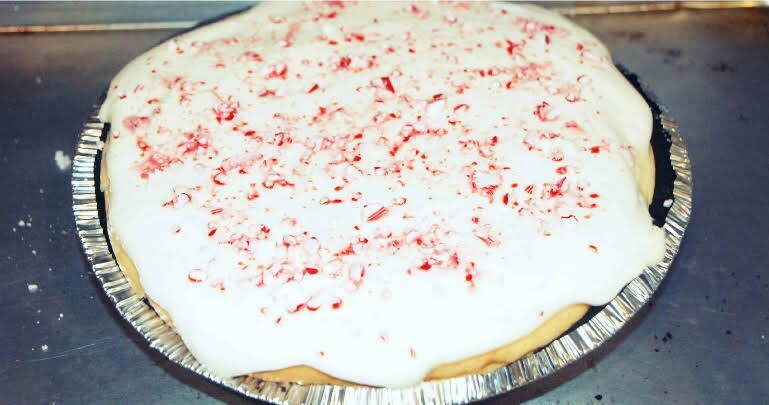 The peppermint is not overpowering because it is just a sprinkle over the top. The majority of the flavor is the Oreo crust with the cheesecake filling and that is a positively delicious combination of flavors and texture. I will definitely make this again and even switch up the topping from time to time! I so agree with her description of this dessert: it is definitely a show stopper! You will see how amazing this can be! In the bowl of an electric mixer, cream together whipped topping, cream cheese and ¾ cup Dark Chocolate Peppermint Sauce until smooth. Spoon mixture into crust and smooth until even. Before serving, garnish with whipped cream rosettes, crushed Oreos, peppermints and remaining Dark Chocolate Peppermint Sauce. Quick Tip: Garnish with some mint leaves for a pretty presentation. Thanks again to Melanie Makes for this amazing recipe.